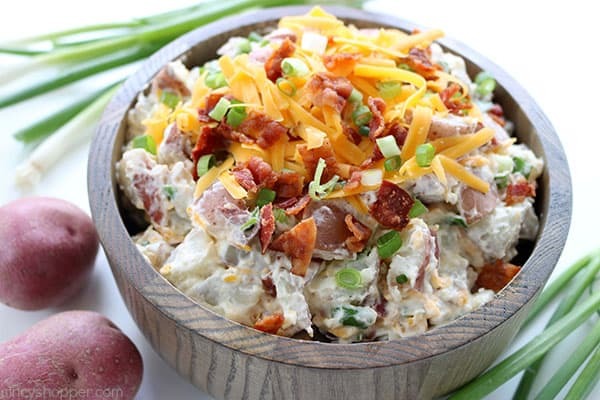 This Loaded Potato Salad will make for a great side dish at your summer picnics and BBQ’s. We toss cubed potatoes with the fixings that you would normally find in a loaded baked potato. Lots of cheese, bacon, green onion, and of course sour cream. When spring hits, we enjoy having picnic foods. We make most of our meat on the grill and I make lots of picnic type side dishes. We had a brief encounter with spring weather last week. I made our Creamy Cucumber Radish Salad and this Easy Loaded Potato Salad. Both were delicious and were perfect for the warm weather. I am totally excited to hopefully get warmer weather next week so we can make some more summer foods. I am ready for warm weather and tasty recipes. 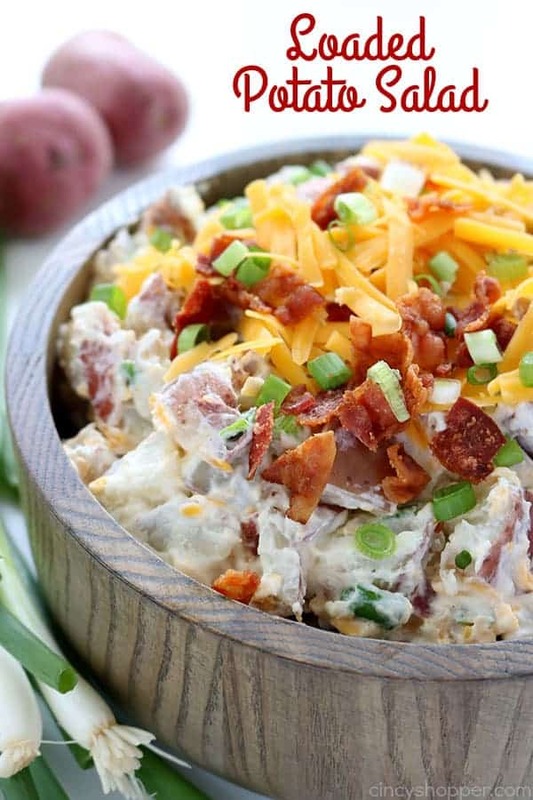 A few years ago, I shared our No Cook Potato Salad. I usually make that recipe for our potato salad side dish. So the family was surprised to find this wonderful combination. 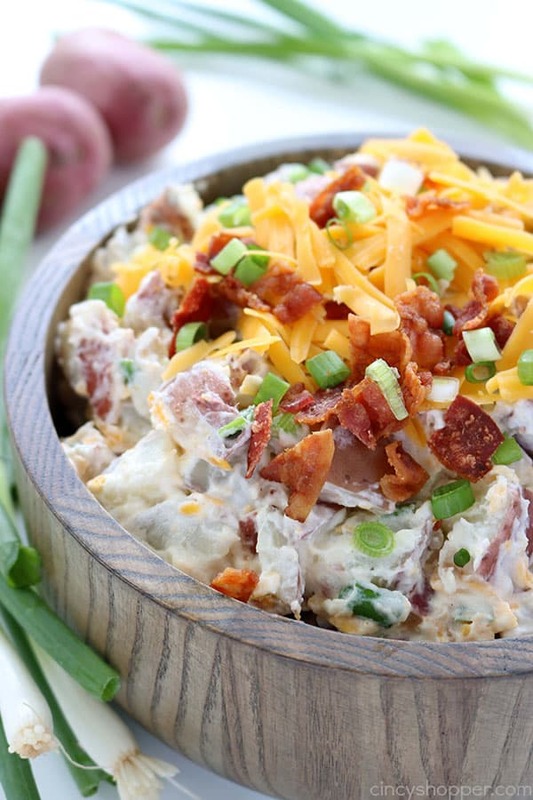 Loaded Baked potatoes are always so delish. The flavors go so well together. 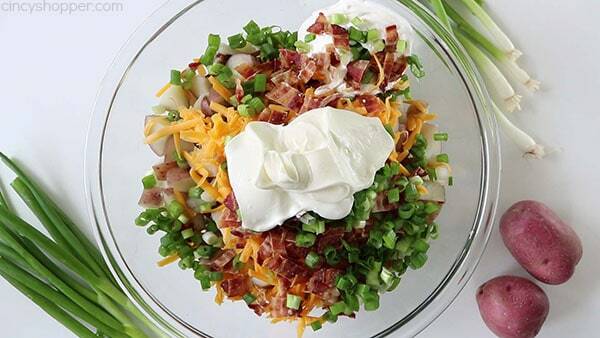 When we combined the mayo, sour cream, bacon, cheese, and green onion in this cold salad, I knew it would be great! Since my family really liked this version, I am thinking I will take it as our potluck dish to our first family bbq. Add to a large pot and add water to cover. Drain and rinse potatoes in cold water to stop cooking. Pour potatoes in large bowl. 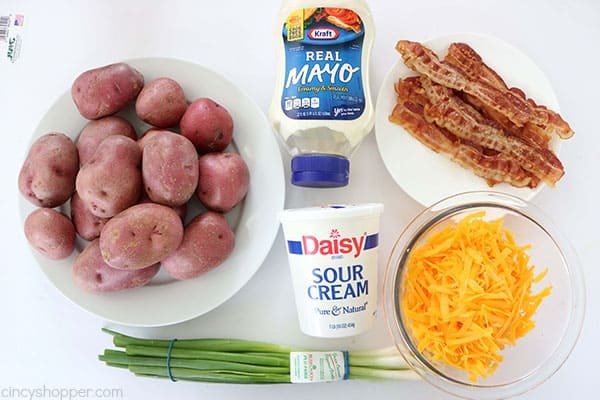 Add cheese, bacon, green onions, sour cream and mayonnaise. 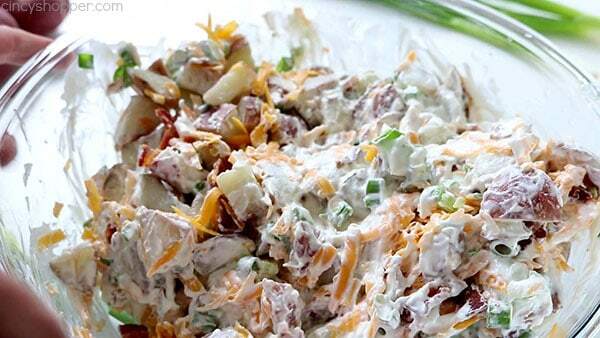 Do you have a favorite potato salad recipe? This Loaded Potato Salad will make for a great side dish at your summer picnics and BBQ's. 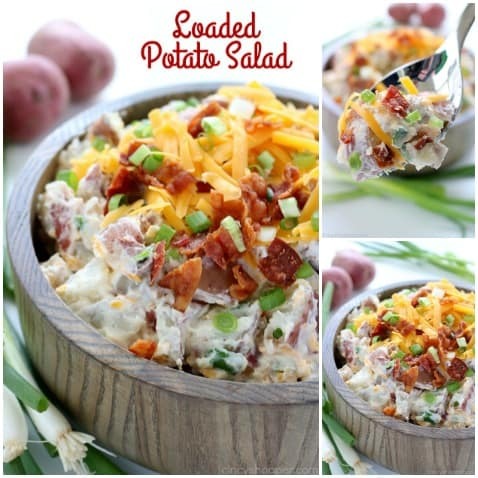 We toss cubed potatoes with the fixings that you would normally find in a loaded baked potato. Lots of cheese, bacon, green onion and of course sour cream. 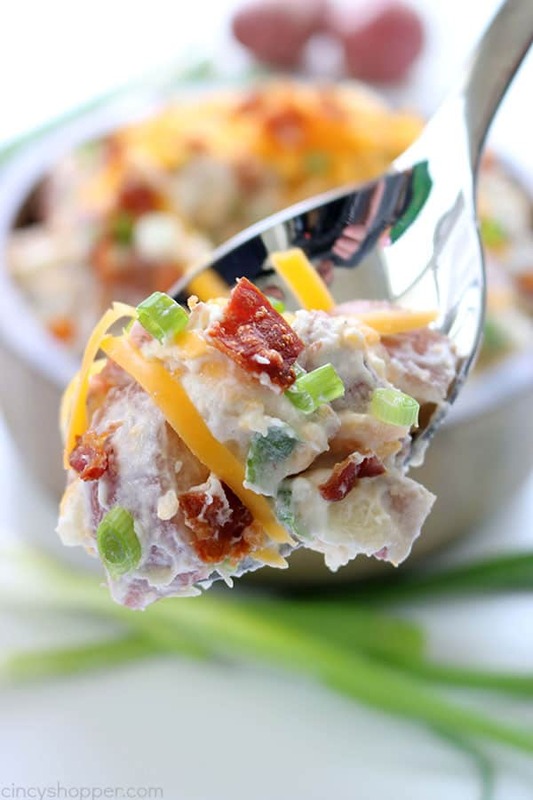 What a great idea to add to potato salad, it’s just like a loaded baked potato. Love this idea. Oh wow! That looks amazing. I just love potato salad but my boys aren’t huge fans of it. I bet they’d love this though with the cheese and bacon. Pinned. Now this is my idea of a potato salad!!! I can’t wait to take this to a potluck that I have coming up. I know that it will be a real hit. Thank you for sharing at Inspire Me Monday link party. This is a meal in a bowl and I love it. Pinned!